I didn’t know what “eating my feelings” was until I started doing it myself in 2016 and then saw Tina Fey do it after Charlottesville. I’ve been working to understand it (so is Samantha Bee, who added another flavor of this coping strategy last week). These are my thoughts. While the wonderful company Banyan Botanicals describes it in detail, you can think of it this way. 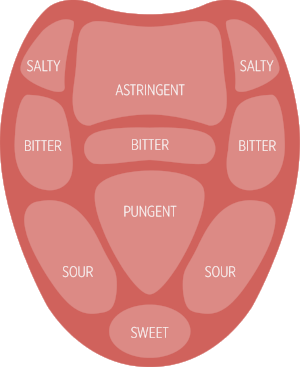 In order to achieve steadiness and ease (“asana”) for the tongue, astringent, bitter, sour, and pungent foods should be the tastes you are primarily eating, enhancing those tastes with dollops of sweet and salty. The sweet taste does have a corresponding organ, though the lungs appear potentially somewhat affected by it. As a flavor, sweet is a sheath of lusciousness around food. It’s also in food — all the -oses, fructose, lactose etc. — and if you wait long enough chewing any bitter food, you’ll see that it becomes sweet right there in the mouth. Modern society has turned this healthy 80/20 truth upside down. We are overloaded in the salt and sweet (carbs mostly), and undernourished in all the other flavors. This reduces organ capacity and health. I would argue that if science studied how we generally eat as Americans, it would find that we are 80% sweet/salt and 20% other. We might even find that the pancreas maps to the tip of the tongue, which is how we have arrived at an alarming rise in pancreatic cancer (RIP Steve Jobs and so many others). We overeat sweets, and, increasingly, over-drink alcohol because we are self-soothing. We can’t help ourselves, the way babies can’t resist mother’s milk and children can’t resist juice boxes. The more we pave over nature and cut trees, the less good oxygen we breathe and the more stressed we become, from everything ranging from lack of exercise to poor sleep (light pollution combined with screens, for example). Adulthood, which could be synonymous with mindfulness, has a lot to do with cultivating the awareness of what supports you and your life, and your family — mentally, physically, and emotionally. What we eat and drink in sweets is what we must start to try to find more of in each other. More love and compassion, more nurturing, more accountability, more sweet quietude. This is not to say that awakening to the layers of violence we all are now, finally together doing, is not cause for major eating of feelings. Through overindulging in carbs and alcohol, we are subconsciously using the sweet taste to reassure ourselves that we are cared for, that all is OK, and that we are safe in mother’s arms. And that we can rest. We have to remember that we have the right to be safe, and the right to rest. On the way back to remembering, we have to cope somehow. We should therefore definitely eat a confetti cake. But we should also work to balance those urges with sustainable choices and care for the tongue, the organs, and the body.